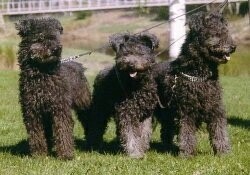 The elongated muzzle of the Pumi is the most distinctive feature of the face. The slightly oblique, dark eyes have close-fitting lids. The tail is a fair indicator of the breed's temperament—always merry and carried high. The ears are upright and tipped forward. The compact hind feet are set back from the body. The chest is deep and ribs are somewhat flat. The feet are strong, with elastic pads and hard nails. The medium-length, curled coat is distinct from the Puli's in that, although thick and long, the hair is not felted and does not form into cords. Coat colors are black, all shades of gray, and reddish brown, but always one solid color. White occurs, but is not favored by breeders. 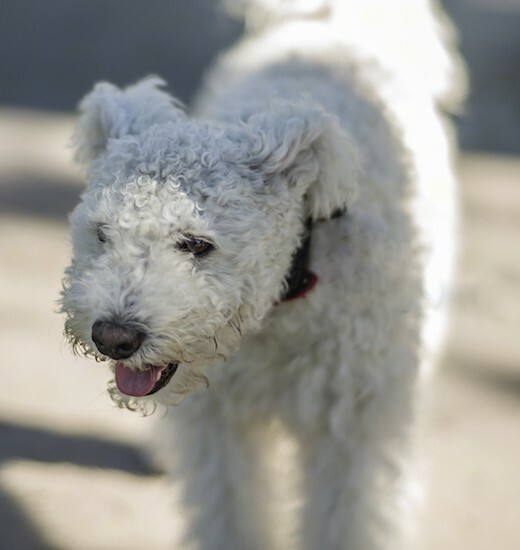 Like the Mudi, the Pumi is a multi-functional dog. It is a vigorous and sturdy sheepdog, but also a successful guard dog and hunting dog. Its probable terrier heritage has given it a great interest in the lairs of wild animals such as foxes and hares. It is said to be a successful ratter and also makes a wonderful family companion. It is alert, watchful and energetic. If this dog senses his owners are weaker minded than himself, he will become willful, believing he needs to be the one making the decisions in the relationship. Ready to spring at the slightest noise, the Pumi is an ideal guardian for isolated houses or factories. This is an intelligent breed that is not difficult to train. They are smart enough to grasp what you mean quickly. It is affectionate with its master and when at home surrounded by familiar faces, it is a happy, cheerful fellow. Shy and reserved with strangers, socialize this dog well. A superb watchdog, the Pumi uses its voice liberally and consistently. If you are surrounded by neighbors where you live, it is sensible to teach the dog that after a couple of barks it must be quiet. 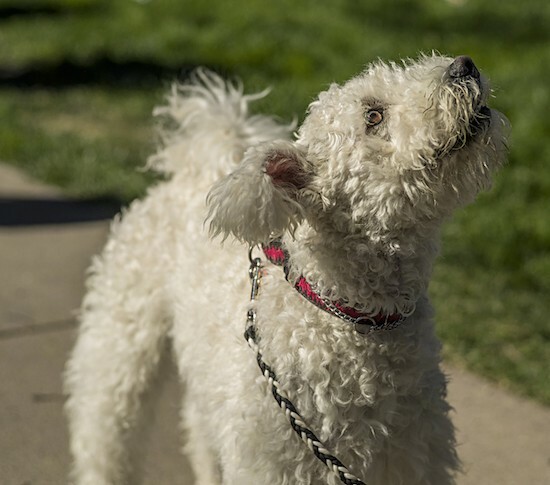 If you find the dog is barking at you in order to tell you what he wants, you must hush the dog and look into your human to canine communication skills, as a dog who barks at you in that way is displaying dominance behaviors. A well brought up and socialized Pumi will get along with children as long as the dog sees humans as below him in the pecking order. This breed can be dog-aggressive if it is alpha and has a tendency to wander. The Pumi is not recommended for apartment life. This is not a town dog and will be happiest where it has work for it to do for the family. This breed can sleep and live outdoors but also likes to be near their family and master. This breed needs a lot of exercise. They are outdoor dogs and will be at their best living on a farm where they will find enough work to do for themselves, such as guarding the entrance and keeping the livestock together. If these dogs are to live in an urban environment then you must find replacement activities to keep them occupied, which includes a daily walk or jog. While out on the walk the dog must be made to heel beside or behind the person holding the lead, as instinct tells a dog the leader leads the way, and that leader needs to be the human. 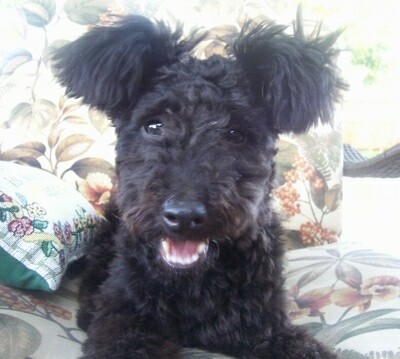 The Pumi will enjoy playing catch, chasing Frisbees, and will excel in agility skills classes. 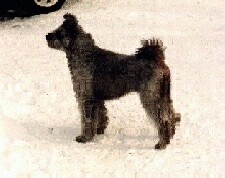 The coat of the Pumi is easy to groom. The braided, medium-length coat does not mat easily. An occasional combing and brushing will keep it looking nice. Remove excess hair from inside the ears. Showing the dog requires special grooming. The Pumi was developed in the 1700s. It was bred from the Puli (and brought along with the merino sheep which were imported in the 17th and 18th centuries) and crossed with German and French prick-eared sheepdogs—probably the Pomeranian or Hutespitz. The blood of ancient terriers probably also flows in its veins. This dog has evolved into a breed of its own over the last 300 years and is gaining popularity in its homeland. It was first mentioned by name in 1815, but it was not until the 1920s that it was recognized as a distinct breed. Developed to drive cattle, it is daring, energetic, mouthy and high-spirited. Its standard describes the Pumi as "unable to keep quiet." His character makes the breed a fine watchdog in remote areas. Hungary has produced a varied selection of livestock dogs. 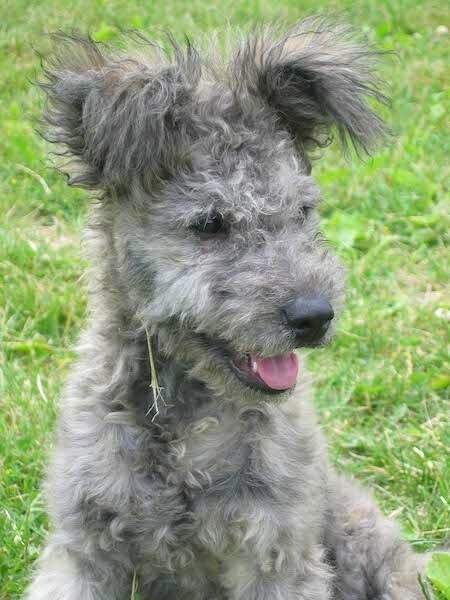 The Pumi is one of the lesser known breeds, perhaps because of its rustic appearance. This is a typical drover, with a burning personality and an alert disposition. As a working dog it serves many functions, such as herding cattle, exterminating vermin, and guarding the farm. The breed is established in North American and across Europe, but outside Hungary its numbers remain small. 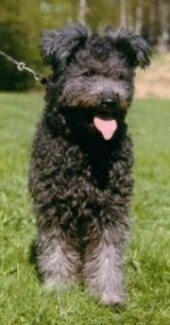 The Pumi is considered the town dog in Hungary, while the Puli remains on the high plains. 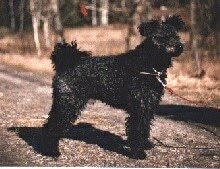 "This is a photo I took of my Pumi Erzsi, shown here at 8 months old. She is a very sweet dog and just loves my 6-year-old Mini Schnauzer Luvy." This is INT & FIN & N & EST CH NORDW-97 ESTW-98 Rakenlov Tudatos Taktus aka Tazzi. This is INT & FIN & EST CH W-93 Karvakorvan Amanda aka Manta.